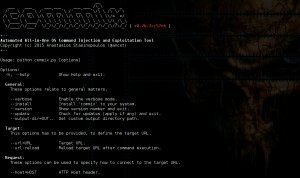 Browse: Home / Commix v0.9b – Automatic All-in-One OS Command Injection and Exploitation Tool. + Fixed: The “–file-read” option to ignore the carriage return (“\r”) character in a text file. + Added: The ability to check for empty value(s) in the defined GET/POST/Cookie(s) data and skip. + Replaced: The “INJECT_HERE” tag has been replaced with the “*” (asterisk) wildcard character. + Added: New option “–level” (1-3) that specifies level of tests to perform. + Added: New option “-p” that specifies a comma-separated list of GET/POST parameter. + Added: The ability to check every parameter in the provided cookie data. + Added: The ability to check every GET parameter in the defined URL and/or every POST provided data. + Added: New option “–all” that enables all supported enumeration options. + Fixed: HTTP proxy logs parser to accept GET http requests. + Fixed: HTTP proxy logs parser to recognise provided HTTP authentication credentials. + Added: Support for verbose mode in HTTP authentication (Basic / Digest) dictionary-based cracker. 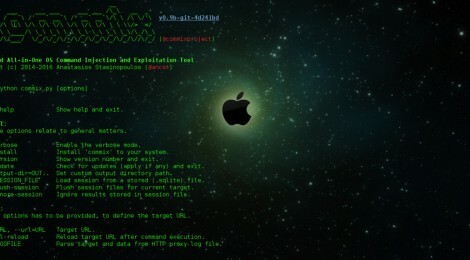 + Added: The ability to store valid (Digest) credentials into session files for current target. + Added: Dictionary-based cracker for “Digest” HTTP authentication credentials. + Added: Support for “Digest” HTTP authentication type. ← mimikatz v2.1 alpha 20160506 (oe.eo) edition; A little tool to play with Windows security.